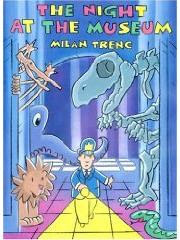 Last weekend we went to the bookstore and chose Milan Trenc's picture book The Night at the Museum. We had seen the Ben Stiller movie many times but didn't know until recently that it was based on a book. As this is only a thirty page picture book, I guess we could say "loosely based". This is a cute book about Larry who starts on his first night as a security guard and falls asleep only to find that the dinosaur skeleton room that he was guarding is now empty. He goes around the museum and finds that everything has come to life -- the animals and even the representations of people! He spends the whole night working hard to feed and exercise all of the animals and learns how things work in this unique job. The film version of this story obviously had to have a more complicated story in order to fill the movie so there is a light-hearted conspiracy added. The guard, Larry, is also given an ex-wife and a kid and the issues that come with that. And last, but not least, there's a museum docent as a love interest. It's a little cheesy in parts but it also has some good messages about working hard and using your brain. The book doesn't really have a message, just an idea. 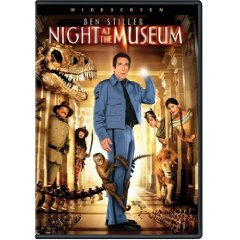 A sequel, Night at the Museum 2: Battle of the Smithsonian, is in theatres now but we will probably just wait to see it on DVD. Verdict: Let your kids watch the movie but definitely take a look at the book. It's full of fun animals and spunky security guards and is appropriate for all ages! Buy the book The Night at the Museum on Amazon or find it at your local library. 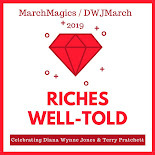 wow, I had no idea it was a book either! Great movie though. hey kristen, i really like reading your reviews. Therefore I'd like to suggest you some books to read (and write a review if you decide so). I had though these films might be a bit old for my 5 year old but if Z likes them then I'll give them a chance. Also didn't know they are based on a book. Jux - I would say that there are things that would probably be above a 5 year old's head (like why the mom is going to not let the dad see his kid if he doesn't get a steady job) but the action is fun and the fights are all very superficial (slapping and chasing and stuff). If you are not quite sure, I would just watch part of it first. Z just likes the action and the animals and dinosaur skeleton come to life and the funny voices of all of the different characters. I didn't know this was based on a book either!!! They look like night and day! My son has liked the McDonalds Happy Meal toys (I type guiltily) but I know the movie would be too much for him so this book might be nice! Thanks! very helpful. I had to laugh when I saw you'd called me Jux -seems funny to have a nickname based on a blog name. Another blogger calls me Juxtie - I think I prefer Jux! I never knew this was a book either!! Definitely adding this one to the list because we love the movie!! Thanks! !